I woke up one day and decided it was a day for molasses. So, so I made molasses cookies. then I got tired of rolling them out and cutting them. There must be an easy and lazy way to make these right? What about a cookie crust? My inner lazy cook offered. But what do we put in it? It can’t be too sweet. I whined. So, time was meant thinking until finally “Cherries!”…and I realized I had spent quality time talking food…with myself. Obviously, I was experiencing molasses withdrawal and needed to bake this up stat. I did…and it was delicious. Cream margarine and sugar in a bowl until soft and fluffy. Add sugar, molasses, and egg. Combine until smooth. Sift flour, baking soda, salt and cinnamon together in another bowl. Add slowly to the creamed mixture. Combine until a smooth dough forms. Press dough into a 9×9 glass pan. Bake at 375F for 6-8 minutes. Remove from oven. Lower heat to 350F. Combine the cherries and water in a saucepan. Heat over medium heat until the mixture thickens, stirring occasionally. Pour mixture over the cookie crust and distribute evenly. Allow to cool slightly before slicing into 12 bars. Serve warm or cool. Tasty either way! Makes 12 servings. Each serving contains 134 calories, 1.9 grams fat, 29.5 grams carbs, .9 gram fibre, 1.7 grams protein. These are fabulous with a cup of chai tea. 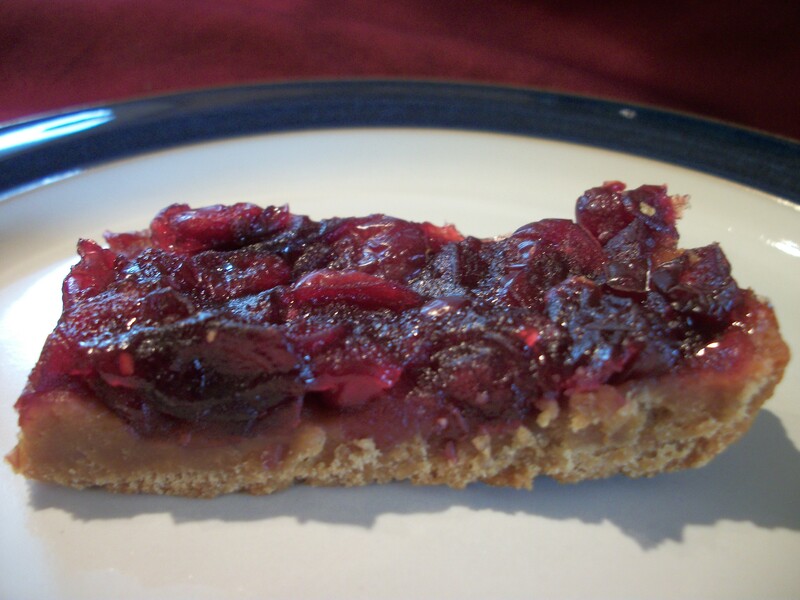 This entry was posted in Comfort Foods, Craving Buster, Dessert, Snack and tagged Cherry, molasses. Bookmark the permalink.